Anita Berrizbeitia has been named as the new chair of the Department of Landscape Architecture at Harvard GSD. Berrizbeitia is already quite familiar with the department as she is currently a Professor of Landscape Architecture at the GSD and the Director of its Master in Landscape Architecture degree programs. "Berrizbeitia is a landscape architect specializing in theory and criticism of 19th and 20th-century public landscapes in the United States and Europe, with particular interests in material culture, design expression, and the productive functions and roles of landscape in processes of urbanization," Harvard GSD said in a press release. 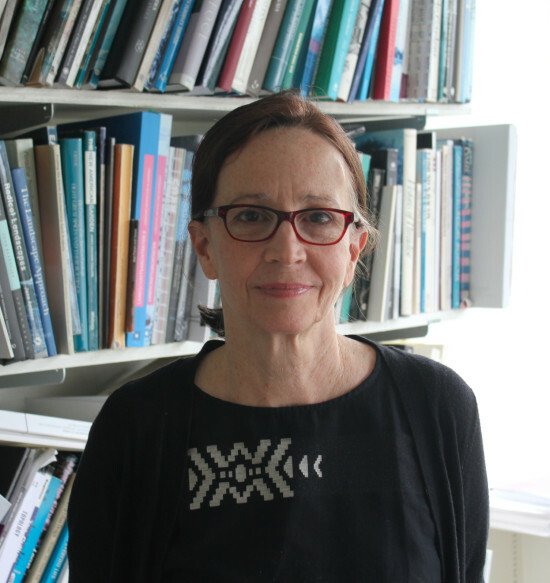 "Her research on Latin American cities and landscapes centers on the creative hybridization of local and foreign cultural practices as a response to a centuries-old process of global cultural exchange; the role of large-scale infrastructural projects on territorial organization; and the interface between landscape and emerging urbanization." Berrizbeitia will assume her new role on July 1. 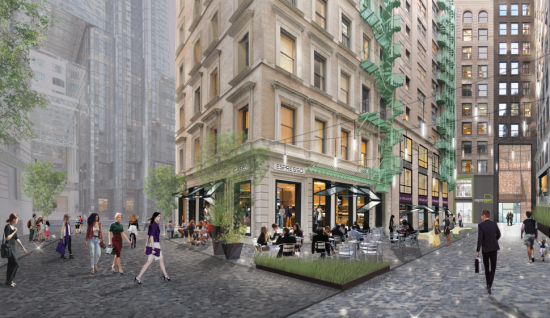 Boston is moving closer to turning an under-utilized part of its financial district into a 24-hour, mixed-used entertainment center. 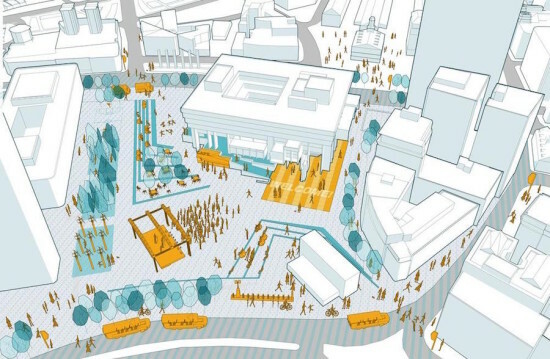 BostInno reported that the Boston Redevelopment Authority held a meeting on the project Monday night, which has been dubbed "Congress Square." 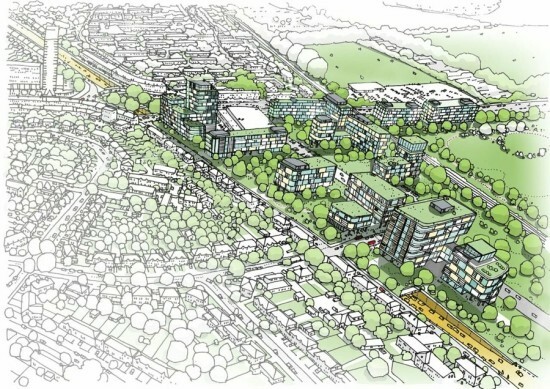 The plan, which is being pushed by local developer Related Beal and designed by Arrowstreet, would breathe new life into a sleepy cluster of buildings around Quaker Lane. "The Project will transform existing office buildings into three components with a mix of ground floor and lower level retail/restaurant uses with either office, residential or hotel uses on upper floors, providing appropriate 24-hour activity to the surrounding neighborhood," said Related Beal in its proposal. "The Project includes approximately 458,300 square feet, of which approximately 92,700 sf is new construction." But the focus of the project, at least from an urbanist's point of view, is the new pedestrian passageway that replaces an existing alleyway. Adding to the people-friendly, placemaking spirit of the project, Congress Square includes new bike storage but no new parking spaces for cars. If everything goes according to plan, Related Beal plans to break ground this year and wrap things up in 2017. On April 18th, 2013, the Boston Marathon bombers went on a crime spree that included the killing of Officer Sean Collier who was shot in the line of duty on the MIT campus. 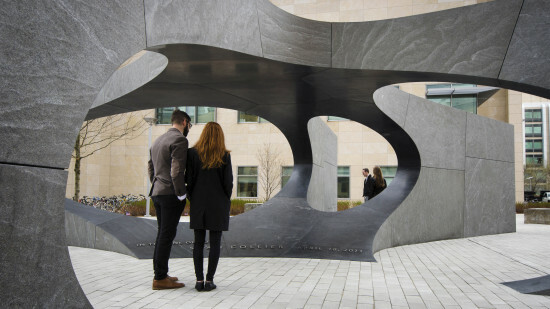 In honor of the slain MIT patrol officer, the university commissioned Boston-based Höweler+Yoon Architecture to design the Sean Collier Memorial—a somber, grey stone structure that marks the site of the tragedy. The heaviness of the unreinforced, fully compressive masonry structure is meant to convey the concept of “Collier Strong,” or strength through unity. Thirty-two solid blocks of granite form a contemporary version of a five-way vault. "Our goal was to not post-tension the structure, to make it compressive and use solid blocks," Höweler + Yoon principle Meejin Yoon told AN, "It could have been built out of concrete or steel, but we wanted solid blocks." The large stone pieces were digitally designed and fabricated to work as a self-supporting structural system. Forces are translated into form via a robust combination of cutting-edge computational processes and ancient techniques for making masonry structural spans. The stones were precisely milled within a .5 millimeter tolerance, so that they fit together perfectly to form a compression ring with a keystone that caps the shallow masonry arches. In the center of the buttressed vaults is a covered space for reflection. The buttresses act as walls that extend out to the surrounding campus context. The novel concept required many moving parts to work in harmony. "It is very pure. It is a simple idea," Yoon said. "It took so much collaboration to make this simple idea have the integrity that it did. There were students from 8 degree programs, including a PhD student, undergraduate architecture, undergrads in building technology, and grads in engineering and architecture." Engineering and design were intricately linked form beginning to end. The whole design process was influenced by a feedback loop of physical, analog, and digital models as well as digital simulation. Massive quarried blocks of stone were cut with a single-axis robotic block saw, then with a multiple axis KUKA 500 robot. Robotic milling processes made the tiny tolerances possible. Some of the blocks took as long as seven days to carve, with machines running 24 hours. Often, the cutting tools would wear down, causing the tolerances to change mid-fabrication. The team compensated by altering the digital model and then the next piece would change to match what had been previously carved IRL. Sensors were placed at each joint as the project was assembled on site. As stonemasons placed the high-tech monoliths into the 32-part final assembly, the structure was a choreographed symphony of new technology and timeless craft. The legible visualization of forces is parallel with the MIT ethos of openness and transparency, while the poetic nature of a dry masonry vault represents togetherness of the community in recovery. The project team also included structural engineer Knippers Helbig- Stuttgart, masonry consultant Ochsendorf DeJong and Block Consulting Engineers, landscape architect Richard Burck Associates, civil engineer Nitsch Engineering, geotechnical engineer McPhail Associates, lighting designer Horton Lees Brogden Lighting Design, and electrical engineer AHA Consulting Engineers. Boston launches a sustainable housing initiative with net-zero energy townhomes. As anyone who has come into contact with Red Sox Nation knows, Bostonians tend not to believe in half measures. A case in point is the city's E+ Green Building Program, a joint initiative of the Office of Environment & Energy Services, the Department of Neighborhood Development, and the Boston Redevelopment Authority. 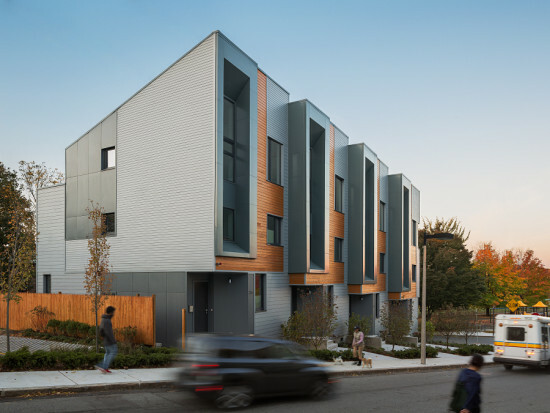 Designed to demonstrate the feasibility of building net-zero energy, multi-unit housing in an urban context, the program made its built debut in 2013 with 226-232 Highland Street, a development consisting of four three-bedroom townhomes in Boston's Roxbury neighborhood. The building achieved substantial energy savings on a tight budget in part through a highly insulated facade constructed from conventional materials. "The envelope is key," explained Interface Studio Architects (ISA) principal Brian Phillips. "We design many super high performance projects and we believe strongly in the quality of the envelope as the starting point." ISA became involved in the project at the invitation of developer Urbanica, who had seen their 100K Houses, a high performance housing prototype designed to be constructed at less than $100 per square foot. One of three winners of the E+ Green Building Program's developer design competition, the Urbanica-ISA team crafted the townhomes with a dual awareness of the project's immediate surroundings and efficiency goals. 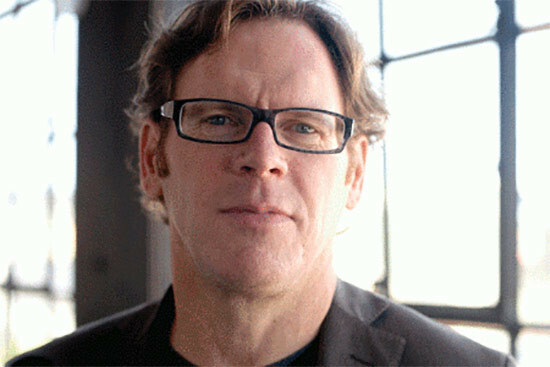 "We're always interested in observing and measuring the context in order to create our design approach," said Phillips. "The materials and shapes of the Roxbury neighborhood inspired our design—as well as the requirements of creating a super high performance building." For instance, he describes the facade's most distinctive feature, a recessed vertical stack of windows, as "a riff on the prevailing bay window typology." The architects' material choices "were motivated by aesthetics, affordability, and recycled content," said Phillips. The primary facade material, prefinished fiber cement lap siding, is common to the neighborhood's existing residential fabric. Each attached house features an interlocking pattern of grey-blue and cedar-textured siding, for contrast, while the reverse bay windows are wrapped in dark grey metal panels. Double-stud walls, blown in insulation, and super tight doors and windows reduce thermal gain to a bare minimum. Thanks to its high performance envelope, energy-generating rooftop photovoltaic panels, and integrated user-feedback system, 226-232 Highland met the E+ Green Building Program's concrete goals, earning LEED Platinum for Homes certification and HERS Index scores between -11 and -15. Even during the unusually cold winter of 2013-2014, the Boston Redevelopment Authority reported, the project recorded energy positive days. But the townhomes also fulfilled the less tangible component of the city's mission, as a demonstration that sustainable housing can be built simply and for a reasonable price. "Green development is no longer just the big high-rises and large projects downtown," said Boston Redevelopment Authority deputy director Prataap Patrose at an event celebrating the building's LEED Platinum certification. "It's happening here. It's happening in our neighborhoods." 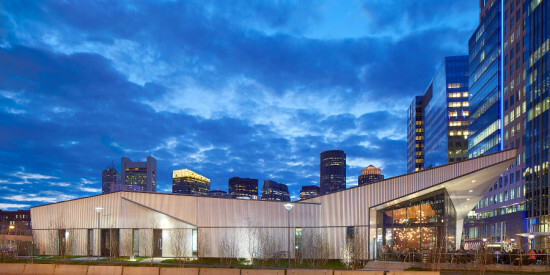 Innovation center's corrugated metal envelope evokes Boston's seagoing past. Commissioned to design District Hall, the centerpiece of Boston's emerging Innovation District, Hacin + Associates found themselves in a unique situation. "There was no context," recalled design team member Matthew Arnold. "We were one of the first buildings down there; we had to build our own story." To fill the gap, the architects looked to the site's history. "In the old days, goods came from around the world to the Boston seaport, then were distributed throughout the United States," said founding principal David Hacin. "We were thinking that this is analogous to an innovation center: ideas are born in this place, then distributed around the world." Wrapped in corrugated metal punctuated by strategic glazing, its two volumes informed by nautical and railroad architecture, District Hall captures both the glory of Boston's seagoing past and the promise of its high-tech future. "The big idea behind District Hall was this two-part building," explained Arnold. A bifurcated design served several purposes simultaneously. First, it allowed the architects to bring a different architectural expression to each side of the program. The larger, more sculptural volume, angled to define the edge of a planned park, acts more like a public space, housing an auditorium and restaurant. The lower, rectangular wing of the building, which is oriented to the existing street grid, contains the innovation center. Second, the two-part form complemented the project's tight budget. "The lower portion of the building didn't require the same level of ceiling heights" as did the auditorium/restaurant space, said Hacin. "We were trying to build volume where we needed it, and not where we didn't need it." On a conceptual level, the bifurcation taps into two elements of the city's past. The taller volume's swooping profile was inspired by nautical architecture, while the lower wing evokes the boxy order of a train yard. District Hall's corrugated metal facade further emphasizes the building's dual identity. "We found this corrugated material to be very intriguing," said Arnold. "It's related to nautical sheds and train cars." Other corrugated facades have begun popping up around Boston, noted Hacin. "But they've used it for the industrial aesthetic, with no real idea behind it. It was kind of cheap, industrial, and cool, but that's as far as it went." Hacin + Associates instead deployed the material as a storytelling device, choosing two different patterns and colors to continue the narrative embodied in the building's form. A shimmering silver metal extruded in a sine wave pattern encloses District Hall's multipurpose wing, while the innovation center is wrapped in matte black with a more squared-off profile. In addition, the architects used flat white trim material to suggest three-dimensionality. "We developed a rationale for how to treat the facade details," explained design team member Scott Thompson. "Where we cut into [the corrugated metal], we treated it as if it was a solid with a different center." The architects minimized glazing in part for budget reasons. "Rather than having lots of windows scattered around, we decided to concentrate them in key locations: at the restaurant, on the corner," said Hacin. "It really is a showcase of the facade material. Sometimes it's about the windows, but in this case the facade material is sculptural—you can see this especially on the silvery volume." The conservative approach to glazing also helps reduce thermal gain. The architects primarily relied on tried and true methods, such as placing few windows on the south-facing facade, and setting the west-side windows back several feet, to meet efficiency goals. "We were really just trying to get the most out of conventional technologies," said Thompson. Ultimately, said Hacin, the true environmental test for District Hall will be whether it is razed in a decade, as planned, or whether it proves its usefulness as a long-term fixture of Boston's Innovation District. "It was built to be a ten-year building," he said. "But my hope is that it will continue to be successful, and that it will become part of the character of this neighborhood—part of what people love about it—in which case there will be no reason to remove it. That would be the most sustainable outcome of all." [beforeafter] [/beforeafter] In recent years, the proliferation of parks, pedestrian plazas, greenways, and bike share programs in cities around the world have signaled an important change in the culture of city-dwellers, one that values walkability, integrated and congestion-free neighborhoods, open space, and environmental health. 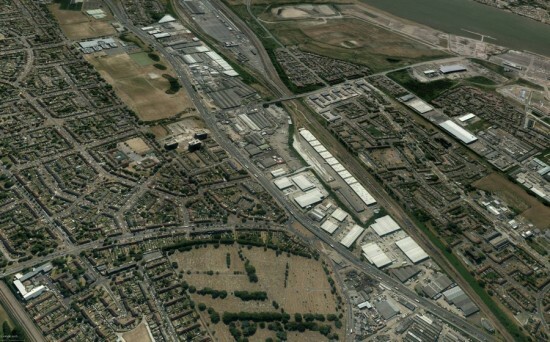 The major thoroughfares, however, that slice through metropolises are not always conducive with this desired urban experience, and take up space that could otherwise be used for housing, office and commercial uses, and parkland. That's why London Mayor Boris Johnson is proposing to relocate portions of key road networks underground. And where better to make this announcement than in and around Boston's infamous "Big Dig" project? "Rebuilding some of our complex and aging road network underneath our city would not only provide additional capacity for traffic, but it would also unlock surface space and reduce the impact of noise and pollution. I am inspired by what the ambitious people of Boston have achieved here at the Big Dig, both in terms of reducing congestion and how they have dramatically improved the quality of life on the surface. 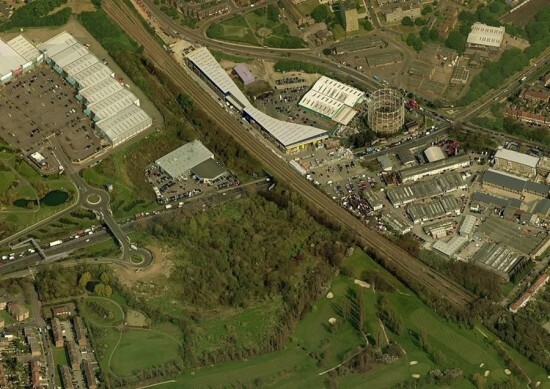 In London we face similar challenges on our roads, but this could also be a fantastic opportunity to better shape our city and support economic growth,” said Johnson in a statement. [beforeafter] [/beforeafter] After taking a look at more than 70 locations around the city, the mayor identified five areas where "the introduction of tunnels, fly-unders and decking could deliver benefits that are in line with the Mayor’s 2050 Infrastructure Plan." 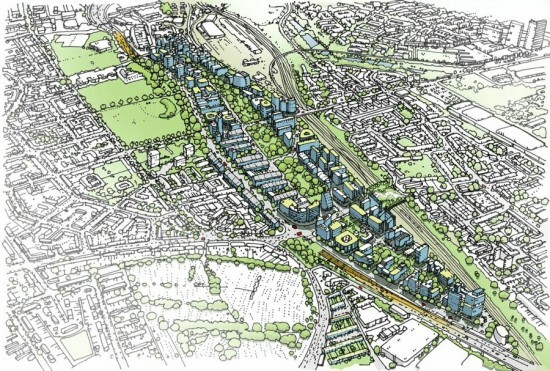 These areas include a mini tunnel at the A13 in Barking Riverside, decking of the A3 in Tolworth, a fly-under at the A316 at Chalkers Corner, a fly-under at the A4 in Hammersmith, and decking or a mini-tunnel at the A406 in New Southgate. 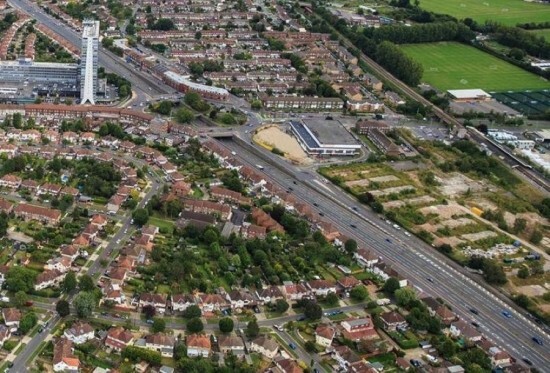 In addition, the mayor says that London's Inner Ring Road is "facing increasing pressure for change" and is ready to be replaced by a new inner orbital tunnel or two cross city tunnels to ease traffic. 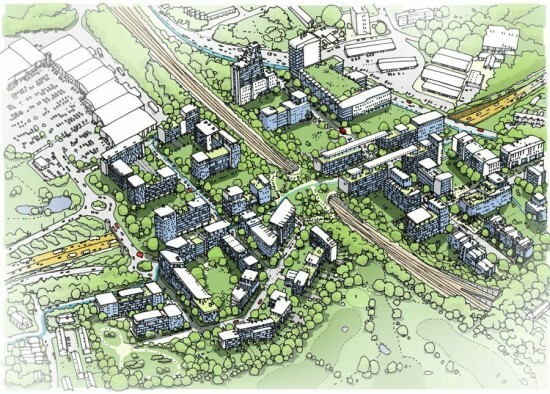 [beforeafter] [/beforeafter] Beyond seeking a more livable city for Londoners, the plan is also designed to address and provide a solution for the city's significant population growth, which is anticipated to reach 10 million by the early 2030s. The "Big Dig" is a tenuous paradigm as the megaproject took 20 years to complete and was plagued with mounting costs, structural problems, criminal arrests, and a fatal accident. Even still, many have deemed it a success in terms of mitigating congestion, decreasing travel time and thus overall fuel costs, and freeing up land for a new greenway. If Boston City Hall were a celebrity, it might be a fixture on tabloid “Worst Dressed” lists. 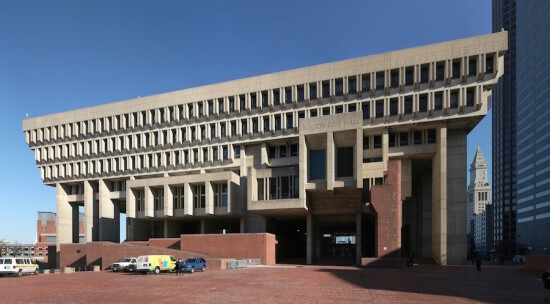 The Brutalist building elicits strong sentiments from architectural observers and everyday citizens alike, but most agree the City Hall Plaza could use some sprucing up. In his inaugural State of the City address Mayor Marty Walsh called on residents to help him reimagine the barren, 11-acre brick expanse. Boston City Hall Plaza is an inductee into Project for Public Spaces’ "Hall of Shame" and rated on par with Barbie’s Dream House by California Home and Design. But perhaps the city can help elevate the windswept space. Even in a city replete with 18th-century Georgian-style churches, the plaza, built in the 1960s, has long been an architectural bane. Walsh’s administration has spruced up the interior somewhat, revamping the 3rd floor mezzanine and installing the Stairs of Fabulousness by artist Liz Lamanche to inject a sorely needed pop of color, but the Brutalist face of the building belies these improvements. The administration has issued a Request for Information (RFI) to gather the data required to take concepts from the drawing board to actualization. Last year, AN reported the municipality’s master plan for revitalization designed by Utile Architecture + Planning with Reed Hilderbrand Landscape Architecture, but other than the replacement of the bunker-like Government Center subway station with a sleek steel-and-glass exterior, little else has been done, notes local news site Bostinno. Other plans announced last year involved replacing a labyrinth of staircases with sloped walkways to ease access to City Hall from the subway station, installing seating, and resolving frequent flooding by planting trees in an open-joint permeable brick paving system to simultaneously green the concrete expanse. Big players the likes of landscape architecture firm Halvorson Design and architecture and engineering firm HDR had signed on. This year, Mayor Walsh’s administration is sizing up plans for a city-sponsored seasonal skating rink to be named “Frozen Harbor” as well as a 20,000-square-foot, glass-enclosed restaurant called “Polar Bar”, according to Boston Herald. Officials have not made headway with securing permits and no project costs or plans have been put forward yet. The Architectural League's Emerging Voices lecture series, now in its 30th year, has reliably identified important new talent through a juried selection process. This year's group reflects a number of important currents in contemporary practice in North America. 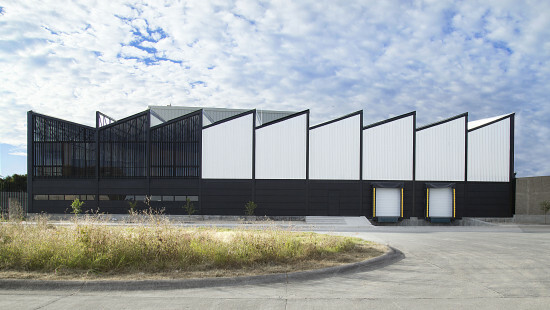 In recent years, a number of young Mexican firms have been showcased, and this year's group includes three practices, Ambrosi Etchegaray, Atelier ARS, and CC Arquitectos, which represent that country's proud tradition of stark and rooted modernism. 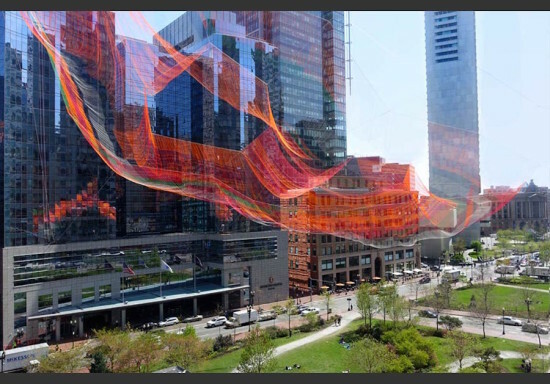 Boston, long seen as conservative place to work, is represented by two young firms, Merge Architects, and Neri Oxman. 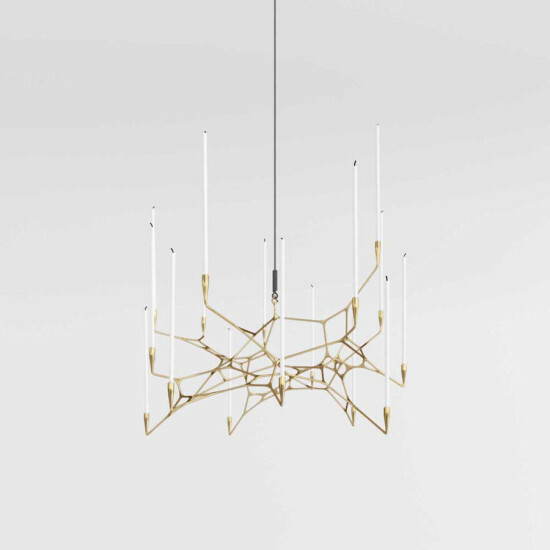 A can-do pragmatism and urbanistic grit informs Philadelphia's ISA, and the pioneering digital designers Aranda/Lasch, based in New York and Tucson, are rapidly moving from installations and furniture to significant freestanding buildings. The emergence of landscape architecture and landscape urbanism is reflected in the design and research of Miami's Studio Roberto Rovira. For a full schedule of the Emerging Voices lecture series, visit the League's website. Full profiles of each firm will be available in the March East Coast edition of AN.